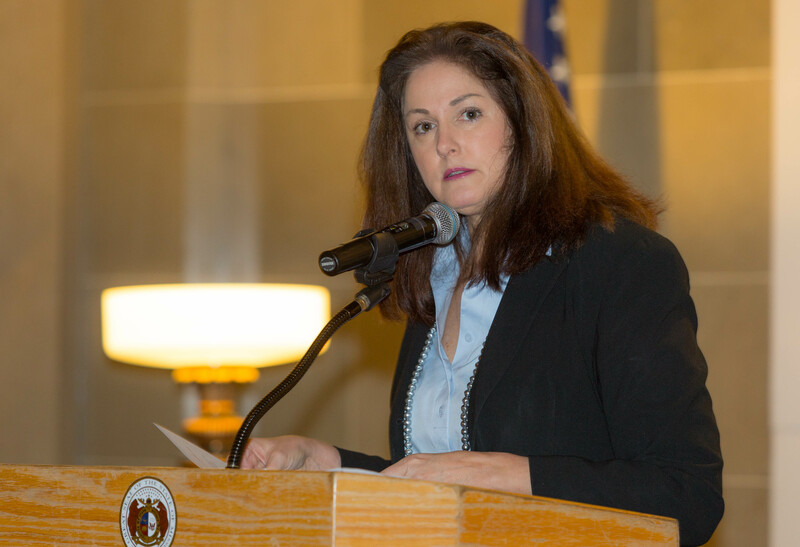 Judy Baker (D) speaking in support of organized labor in Jefferson City, March 25, 2017. But times like these require the best of us. It requires that we get up, stand up, rise up, and speak up. And that’s what we are doing today. When we come together as in past days of the labor movement we join hands, we lock arms, we march again and again. And as Martin Luther King, Jr. said, all progress is precarious. All progress is precarious. That phrase has come to live with us this past decade and culminated in the most under represented political system of our lifetime. Do you feel unrepresented? I feel unrepresented. A lot of people, the majority of this country, feels unrepresented. Well, we’ve come here today, ever so small, but ever so mighty, to tell the powerful that we are awake. We are awake. Because of fear we have seen the rise of those who want to take us backwards. But we are awake. They want to restore some ideal they have in their mind when power was concentrated and they little guy served the master. But we are awake. They want to harken back to a day that never really existed. But we are awake. …The tragedy [Triangle Shirtwaist Factory fire] brought widespread attention to the dangers of sweatshop conditions in factories and led to the development of a series of laws, and yes, regulations, those terrible God awful things, that save people. The danger of fire in factories like the Triangle Shirtwaist was well known, but high levels of corruption in both the garment industry and city government generally insured that no useful precautions were taken to prevent fires. For a hundred and six years since the labor movement has worked hard to change that using the influence of joining together, leveraging bargaining power, and the power of marching, striking, and speaking up. We stand here today to do the same, because the times call for it. The defeat of the [Republican] health care bill yesterday proves that we can make a difference. The people of the United States see that the doors are locked and being locked every day, they see that the ladders don’t reach to them, they see that the safety nets are broken. So they stood up, they marched, and they spoke up against the seriously flawed health care bill, a so-called fix, because we are awake. The assault on worker’s rights is a national movement. It will take a national movement to take it back. While the GOP has had its way on right to work for less in Missouri this is not over. The people have yet to speak up and speak on it. And they will on a referendum. 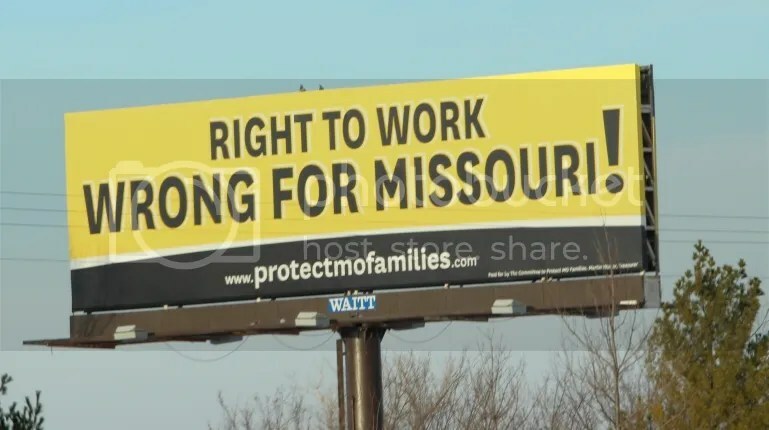 Missouri, prior to the passing of right to work, recently was considered a battleground state on the issue. We’re here today to show it is still a battleground state on the issue. We are here today to show it is still available to the voters to make up their minds. The average worker in right to work states makes twelve point two percent less than other states. Missouri can’t afford that, frankly. The average worker is less likely to have health insurance. Right to work states have higher poverty, more infant mortality, weaker education systems, and higher workplace fatalities. The decline of unions in this country is directly correlated to the rise in income inequality and poverty. The transfer of wealth has been to the wealthy. Insuring worker’s rights insures all boats can rise together. We can’t expect the politically connected to give back power now. It will take the coordinated efforts of the many to take back this power. I am here today to do two things. 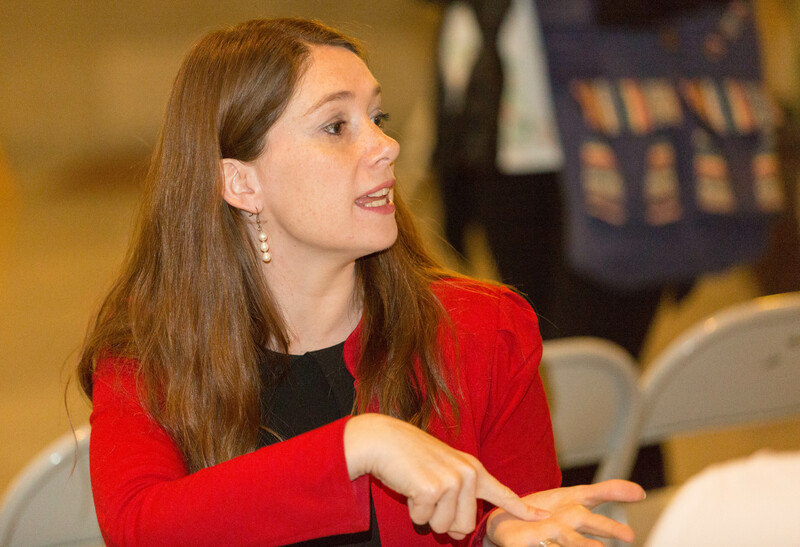 Help rally hard working Missourians to action for the next election, to bring about change, elect people like Michela Skelton [in the 50th Legislative District], and build the wave we need to bring Missouri back to its roots of Democratic and working family values. The best thing that we can do to rally is remember that rally is a verb. It means to gather, organize, and inspire anew. So, what will rally us? I think it is to refresh, and to commit to what it is we know to be true about our values and spend less talking about what we are against. And stand firm for what we are for. We will make change by empowering people to fight for and build our future. One of my favorite Martin Luther King, Jr. quotes is, human progress is neither automatic nor inevitable. Every step toward the goal of justice requires sacrifice, suffering, and struggle, the tireless exertions and passionate concern of dedicated individuals. You’ve proven today you are. This is us. This is who we are. We’re the ones who by our actions and voices can make a difference. And we must be on the lookout for anyone who’ll put party before people. When you woke up today you realized you were powerful. You were worthy of standing up. And others were worthy to stand up for. When you woke up today you realized this movement can happen without you, but will be better with you. When you woke up today you remembered what you were passionate about. We are awake. And being so, think of all we can do. There is much to be done and the times demand it. Let’s do this together. If you can’t go door to door, then write a note. If you can’t write a note, then make a call. If you can’t make a call, then send a contribution. If you can, do all of these things. Just stay awake. Let’s unlock the doors, extend the ladders, and strengthen the safety nets. We can do this together. 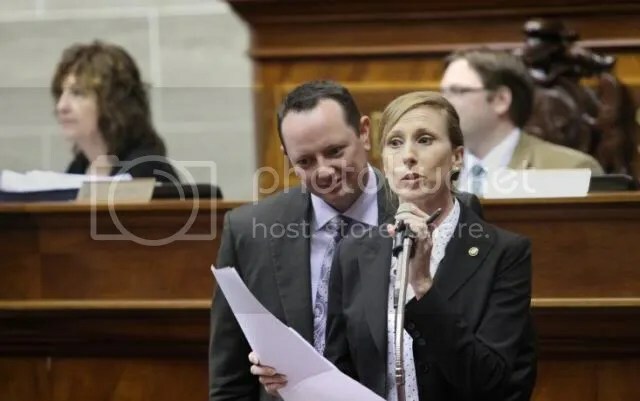 Michela Skelton (D) after speaking in support of organized labor in Jefferson City, March 25, 2017. 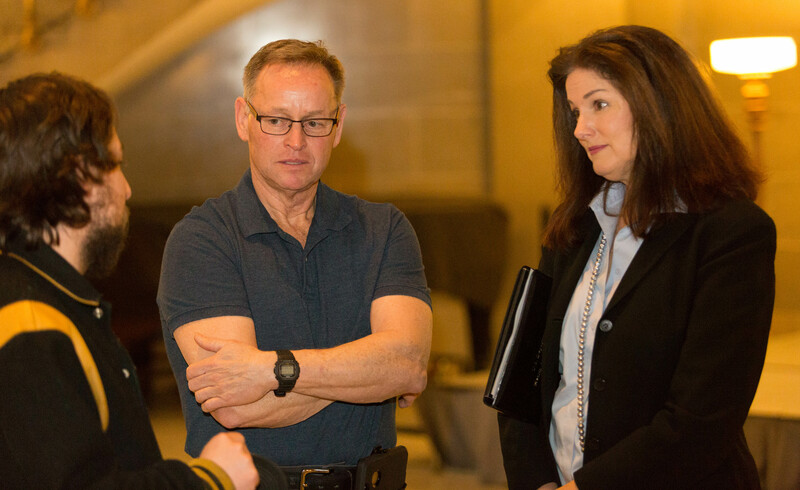 The Missouri Constitution requires a constitutional majority for final passage of a bill. 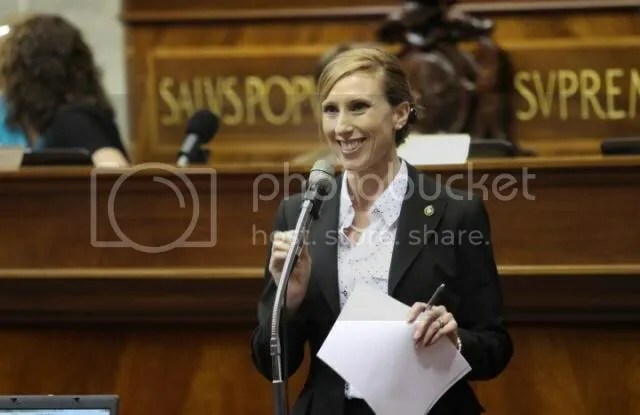 House Bill 1770 was perfected by a vote of 78-68, four votes short of the constitutional requirement for final passage. 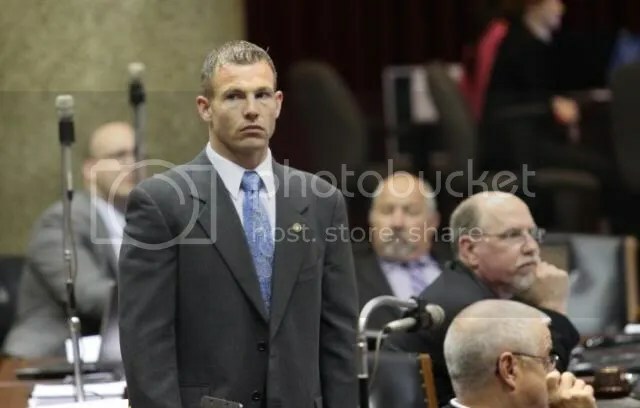 Republican Missouri House Speaker Tim Jones offered a full-throated case for Right to Work legislation Thursday night, placing the policy front and center in his agenda for the new year…. Paid for by Committee to Protect MO Families Martin Walter, Treasurer. Some more suggestions for celebrating Labor Day: Get a copy of Labor’s Untold Story: The Adventure Story of the Battles, Betrayals and Victories of American Working Men and Women by Richard Boyer and Herbert Morals, and begin reading it. John Dos Passos’ U.S.A. Trilogy is also a great, if pessimistic, mix of fiction, news clippings and biographical sketches that present the social ferment of the 1920 and 30s. It’s not just history, but one of the greatest literary achievements of the 20th century. For those who prefer movies, my favorites are the 1999 film, Cradle will Rock, and, of course, John Sales’ Matewan. … control information about what workers should be eligible to vote in an election, allowing them to pad the numbers required for the 50 percent of workers now required to even hold an election. Then employers would be able to delay the election, find out which workers were supporting the union and intimidate them. Not only that, but in cases where a larger non-union airline and a smaller union airline merged, the union and the contract would just be gone. GOP efforts to gut union protections have held up a long-term FAA authorization for five years, and the compromise was negotiated by the Senate Democratic leadership. Add these considerations to the fact that there were lots of good things in the bill – it will facilitate the transition from radar to GPS flight control, for instance – and it becomes clear that remaining steadfast in support of the unions represents a reasonably tough-minded stance for a politician who has reliably wavered on most progressive issues. 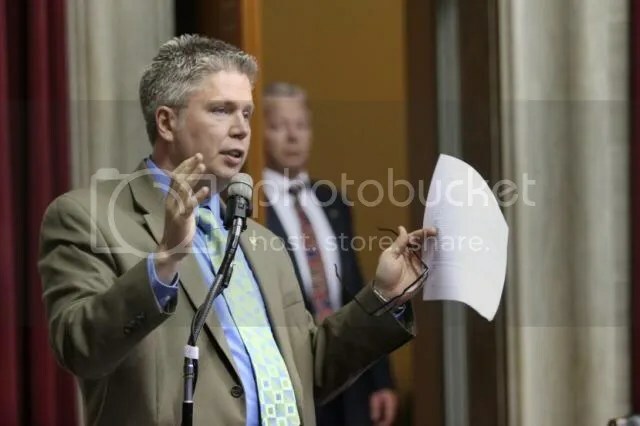 Last week, McCasill scored when she stood up for reproductive rights and signed a letter protesting the Komen Foundation’s politically motivated treatment of Planned Parenthood. This week, by standing up for the right of unions to organize, she scored big for a second time. Who knows, maybe acting like a progressive will become a new habit for Senator McCasill – and if not, it’s good to know that there at least two issues on which we can count on her support.